Structure Gel Soak-Off Gel A thicker viscosity gel designed to improve damaged, uneven or troubled nail plates. 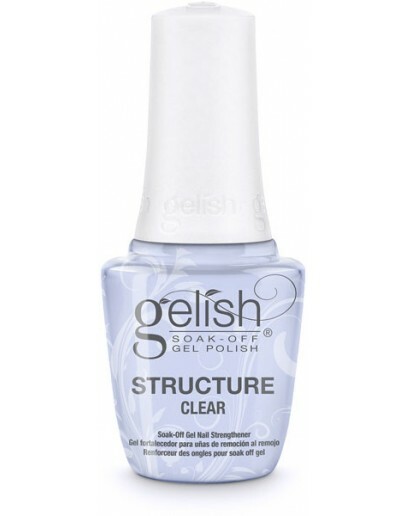 Structure Gel will soak off like all other Gelish® Soak-Off Gel Products. THICKER VISCOSITY Will enhance the strength of the natural nail and create more durability. MULTIPLE USES Corrects damaged nail plates by filling in ridges or demarcations to make the nails look even. VERSATILE APPLICATION Structure Gel gives the technician the versatility necessary to repair damaged nail plates or hide imperfections. As a strengthener after Foundation Base Gel. To hide imperfections for flawless nails. To encapsulate 3D nail art.